Taken from genuine unsolicited testimonials. See others at the bottom of the left hand index. Hello Mr.Pen ive just received the F cursive italic. This is by far the smoothest nib ive ever used, like a light-saber through butter, the line variation is subtle but the nib seems to be a bit springier than my past pen, thank you once more. couple of fountain pen forums eventually)! Having had my Parson's Essential for a couple of weeks now I just wanted to say what a superb pen it is. The nib is the best italic I have ever used and it continues to give great pleasure. Thank you. My trio of Parson's Essential pens arrived today. They are lovely and write beautifully. As with any new fountain pen, I dipped them first to try them and they passed that test easily. When I filled them, I was delighted with how wet they write. They are a joy. I have spent some time comparing them to my Visconti Homo Sapien, my Pelikan 800s, my Edison Beaumont, and my Waterman Charleston -- pens I consider among the smoothest and best in my collection. So far I can't find another pen that is as wet and smooth for the nib size/line width as the Parson's Essentials. I got the trio with a fine, a fine italic, and a medium italic. You were correct that the fine italic shows very little line variation. But it is, astonishingly to me, the smoothest writer of the three. I would have expected the medium to be smoother than the fine. Was I just lucky to get a fine italic that is as smooth as it is, or is there some other explanation for the italic fine being so much smoother than the italic medium? Is it that the slight cursive finish to the fine makes it feel as smooth, in which case, if I am noticing as much of a difference as I am, should I be looking to get a medium cursive rather than the medium italic finish I have? Thank you for sharing your expertise and time. And again, thank you so much for providing such excellent writing instruments at such a modest price point. I have waited for 65 years to find the perfect fountain pen. At last I have found i. The Italix broad cursive nib is simply wonderful and the pen itself is attractive and robust. I bought it after losing my ancient and much loved waterman, Thank you. Thank you for sending the fountain pen so quickly. It is beautiful and writes so well. Great value.! I have had some poor experiences purchasing a variety of fountain pens so I was sceptical about all the positive reviews I read before buying the Italix Parson's Essential. is a deeply pleasurable and trouble free activity. Thank-you for a first-rate product, and I hope to use mrpen again in the near future. Since I purchased my first Parson's Essential from you, I have experienced the feel of many high value fountain pens including Visconti, Montblanc, Waterman, Sheaffer, Pilot, Platinum, Sailor, Cross, Parker and Lamy. Without exception I return to the Parson's Essential which always starts first time, never skips and has the most luxuriously smooth nib that, to date, has not been equalled. That this pen is available at such a reasonable price is remarkable, and the assertion that it compares well with pens at £80 is overly modest in my view, because I am comparing the writing quality with pens at up to £450. I have given these pens as gifts and also have 4 of my own, and I am thoroughly delighted with each one, and have received glowing reports from the recipients. All this quality is backed with your truly excellent service and delivery. Please feel free to publish this - I have no hesitation in recommending these pens - in fact if anyone is interested in fountain pens, this one is definitely "Essential". You may recall that I ordered a 'Parson's Essential fountain pen with a broad cursive nib about two weeks ago. I'd like to tell you just how pleased I am with my pen and the service I have received from Italix! My pen arrived about four or five days ago. I have used it constantly, and with increasing pleasure each time I remove it from its handsome box. The performance of the nib has far surpassed my original expectations, as have the fit and finish of the pen. Under separate cover I plan ask you if the nibs are interchangeable, and if it is possible to order a medium cursive-stub for this pen? I wish to thank you and your company for producing the Parson's Essential fountain pen. Without any question this is the most exquisite pen I have ever owned. It writes so smoothly, it floats over the page producing a fluid, perfect line. When I look at the range of pens that I have, I also feel that I should also complement you for producing the finest value of any pen I own. To anyone interested in purchasing a top of the line fountain pen, I recommend the Parson's Essential. ps. Feel free to use my comments above if you like, and thank you for your prompt and courteous service. Northbound mail, if not Southbound. known pens I own which cost considerably more. Mr Pen: 10/10! Many thanks for the fantastic service. I ordered a Parson's Essential on Thursday afternoon, December 13th and it arrived at lunchtime on Friday December 14th. I'm not sure how you and the Post Office managed, it but I am delighted with such prompt service. The pen , in amber with medium nib, is an absolute delight. It has exceeded my (high) expectations for smoothness and free flow. I have inked it with Diamine Onyx Black and it lays such a beautiful line that I can't stop writing with it. I will certainly be back for another pen or two as soon as funds allow. Thank you again and may I wish you a very Happy Christmas and a healthy and successful 2013. Sorry I have not contacted you earlier. You were very helpful with advice about oblique and ordinary nibs and I eventually decided to go for the medium nib as the pen was for everyday use. The pen arrived next day and I am absolutely delighted with it, finding excuses to write rather than type. The nib is the smoothest nib I have ever used and the pen now goes everywhere with me. If you have since had an order from a Mark Roberts, it is because I showed him the pen and he was very impressed. I have just given you an excellent review on TrustPilot. I am sure we will do business again sometime but meantime thank you for your help and the quality of your product. 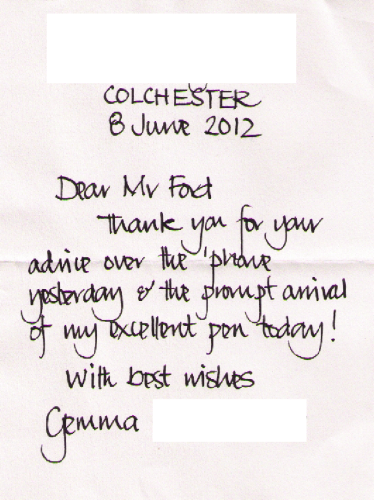 An exemplary pen (as good as my Mont Blanc and Parker 51) and also super customer service. I will be ordering more as presents! Happy for you to quote me on your website - I will be spreading the news in Melbourne Australia on my return next week. italicist, I've found it increasingly hard to find a good pen - this is quite frankly the best one I've had for years and years. beautiful flow and a very pleasing weightiness I haven't come across in a long time. I'll certainly be back, if only because I now want to buy everyone else one! Today, the fountain pen arrived. It's a wonderful pen, looks as I like it and writes super out of the box. I'm very happy with the "Italix Parson's Essential", a pen, I was looking for many years 'til found it now. I'll recommend it to my friends. Just wanted to compliment you on the quality my new Parsons Essential pen in M italic. What an amazing nib! Do you grind/finish the nibs in house? Whatever the case - very impressive! We do grind the nibs in our own workshop. I am e-mailing you to tell you how happy I am with the product I received and the service you provided. My Italix Parsons Essential arrived the next day after ordering, before 1pm (at 12:59 exactly) as promised. I am delighted with the pen: it is of good quality, it has a smooth nib, it is aesthetically pleasing, and the price was just great. I was so pleased with it that I recommended it to my friend Stephen Brown (Stevemeister) who also ordered one. He has just uploaded a brilliant review to youtube, Stephen loves the pen. And he said that the nib is one of the smoothest he has ever used. I hope this feedback is useful, and thank you for the pen. This is just a short note to let you know that I was shocked by the amazing quality of this Italix Parson's Essential pen, you have sold me italic broad. I own pens ten times the price of this one, whose nibs are not even close to the smoothness of the Italix nib. many thanks from a satisfied customer. Just thought that I would drop you a line to express my thanks for such an excellent service. Also I would like to say that the pen, The Parson's Essential is excellent. I have ordered another ! Thank you for your very rapid service in sending each of these pens in the last few weeks. I have written almost exclusively with fountain pens for decades, but not previously with italic points, which I was interested to try. Both sizes I have found easy to adapt to, writing as rapidly as I normally can with a round point as necessary, and the italic line is very pleasing. The quality of the pens themselves is very robust and I look forward to many years of use. I recently purchased an The Italix Parson's Esential via internet from "Mr Pen" and everything about this experience was superb. First of all, I emailed Mr Ford at the company to ask a few technical questions about the choice of nibs. I sent my message on a Sunday afternoon, expecting to receive a reply when they reopened for business the following day. I was greatly surprised when I received a reply about 1 hour later (yes, on a Sunday!). The pen arrived here in Malta within 3 days of my order (parcels usually take between 5 - 7 days from UK to Malta). The pen must have been dispatched in record time - I couldn't believe it! I ordered two nibs for my pen: a medium nib and a broad italic. Both nibs were excellent, smooth and wrote perfectly well from the get-go. I did not have to play around flushing the pen with soapy water, etc. The medium nib was perfectly suited for my hand, but the broad italic was a little too wide for my personal needs. I immediately realized I had made a mistake in this choice and sheepishly emailed Mr Ford to ask whether I could exchange it for a medium italic. Again, I got an immediate reply: he very kindly accepted. That's not all: I received the new nib within 7 days of my sending him the first one. He also insisted not to charge me for the postage and packing costs he incurred on my behalf (even though I was the one to make the mistake in choosing the broad italic nib). The pen is exceedingly well made. Although it is not expensive, its quality and elegance really shine through. You'd have to hold it in your hands to believe me. The ink flow is spot on and the writing experience is really wonderful. One last thing: the converter. I have come across many converters that suffer from surface tension problems that leave the ink "hanging" at the top while the feed becomes starved of ink. Not so with the converter in this pen. Its as if the inside of the converter has been coated with something that prevents the surface tension problem. I'm not sure whether this is actually what has been done, but that's the impression I got. So in summary: I got a fabulous pen with a choice of two really excellent nibs at a fraction of the cost of so many other pens of similarly high quality. Most of all, it was really a pleasure dealing with Mr Ford: he is a very kind gentleman of the old school. The impression he gave me is that he is not merely selling pens, he is ready to provide wonderful service to a fountain pen enthusiast like myself. I ordered a Parson's Essential fountain pen on Tuesday, and it arrived on Wednesday morning as scheduled. I wanted to thank you for your very prompt and efficient service, and also to say that I am amazed at the quality of this pen for the price that you charge. It is beautifully lacquered and tastefully decorated (enhanced again by your very nice and free engraving of initials), the weight and balance are superb (I write with the cap unposted personally, but it posts securely for anyone to whom that matters), and the nib is smooth and a delight to write with straight out of the box. This pen puts to shame many of the leading brands at much higher prices for sheer overall build quality and feel, and for me it also surpasses many vintage pens that I have owned. To top all this off, I see that replacement nibs are available at a very reasonable price. Thank you for dispatching my fountain pen (a Parson's Essential) so quickly! It arrived about an hour ago and is already in use, I can't believe the quality of such a cheap pen, it is ridiculously good. The final thing is, the nib is OK, not as 'medium' as I had feared.